이 벽화는 1997년 1월 16일에 발견되었으며 현재는 보존처리 한 후 사찰박물관에 보관되어 있다. 화면은 중방부분이 휘어지면서 부분적으로 균열이 생기고, 자연적 또는 인위적으로 훼손된 부분이 많아 제 모습을 상당히 잃었으나 구도 및 색채 그리고 일부의 문양 등은 판별이 가능하다. 내용은 설법인(說法印)을 짓고 있는 중앙의 본존불을 중심으로 여러 권속들이 에워싸고 있는 도상으로, 남아 있는 화기를 통해 석가모니불이 영축산에서 『묘법연화경(妙法蓮華經)』을 설하실 때의 장면을 도해한 이다. 전반에 걸친 무거운 적·녹색 위주의 채색을 사용하여 다소 묵직한 느낌이 강하지만, 본존불의 선홍색 법의와 호분이 많이 가미된 연하늘색과 연분홍색 등이 잘 조화를 이루며 장중한 분위기를 연출하고 있고 뛰어난 필치와 밀도 높은 구성력을 보여주고 있다. 이 벽화는 현재 정확한 제작시기를 단정할 수 없지만 대웅전 해체수리 때 종보 하단에 덧댄 통보아지 상면에서 발견된 1435년의 「대웅전중창기」, 1436년의 정면 어칸 기둥 묵서명 등을 통해서 볼 때 1435년을 전후한 시기에 제작되었을 것으로 짐작된다. 따라서 봉정사 대웅전벽화는 현존하는 우리나라 최고의 로서 1476년 와 함께 조선 초기 불화의 쌍벽을 이루는 벽화이며 이후 전개될 군도형식의 영산회상도는 물론 여타 불회도(佛會圖)의 조형(祖型)이 된다는 점에서 큰 의의가 있다. This mural painting was discovered on January 16, 1997, and after conservation treatment, was placed in the museum inside the precincts of Bongjeongsa Temple where it still is today. The mural is crackled in places, due to the distortion of the horizontal wood bar at the mid-level of the wall, and has also suffered extensive damage, from both natural causes and human sources. Much of its original appearance has therefore been lost, and aside from the general composition and colors, only some of the decorative motifs can be made out. The mural represents Buddha with his hands in the vitarka mudra, surrounded by several attendants. From the information provided in the note, still legible, one learns that the scene represented is that of Sakyamuni Buddha preaching on Vulture Peak. The mural has a heavy feel about it, due to a somber color tone, having red and green as the two dominant colors. But, these colors form a nice contrast with the light blue and pale pink containing large amounts of chalk, used for the main Buddha’s crimson robe, creating a solemn and majestic atmosphere. The date of creation of this mural cannot be precisely determined. But, based on the repair record for Daeungjeon Hall, dating from 1435, which was discovered above a beam bracket during the disassembling of the building for a repair, and the inscription on a façade column, written in ink, dating from 1436, the mural is likely to have been painted in around 1435. The Mural Painting of Bongjeongsa Temple is, therefore, the oldest surviving painting of the Vulture Peak Assembly. 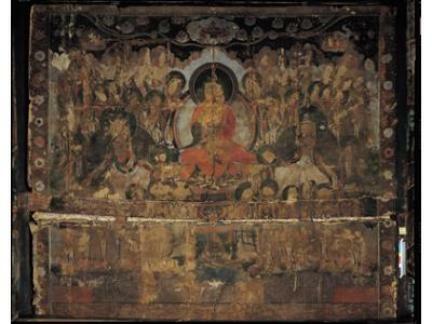 One of the two major examples of early Joseon Buddhist paintings, along with the Mural Painting of Amitabha Buddha in Geungnakjeon Hall of Muwisa Temple in Gangjin (1476), this work is also of high significance as the prototype of other paintings depicting the same scene from subsequent eras, featuring large Buddhist pantheons.